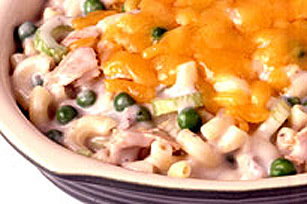 Peas, celery, tuna, macaroni and cheese come together in a tuna casserole that’s pure, family-pleasing comfort. One-dish cooking has never tasted so good. STIR together frozen peas and chopped celery, with cream of mushroom soup and milk in a large microwaveable dish. Microwave on HIGH for 10 minutes or until vegetables are tender. ADD tuna, macaroni and 1 cup (250 mL) cheese to vegetable mixture. SPRINKLE with remaining cheese and microwave on HIGH for additional 10 minutes or until hot and bubbly. Try carrots instead of celery.